We first met Helen and Mike at the Prince Albert in Camden in October last year. We bonded immediately over a bottle of red and a mutual appreciation for B&Q in Leyton. The wedding reception was to take place at the Prince Albert pub in early January and the idea was a wildly romantic London winter wedding with muted, faded tones of dusty pinks, creams and bronzes. Helen's bouquet had a 'just - picked' meadow vibe, tied with long lengths of matt pale gold and a contrasting ivory ribbon, whilst Romy, the flower girl, had lengths of dusty pink and ivory for her smaller posey. The dinner tables were decorated with medicine bottles of varying shapes and sizes, some amber and some clear, filled with anenome, astrantia, mimosa, eucalyptus and red wax flower. Wonderfully, Mike's mother and aunt had dried hundreds of stems of fresh flowers cut from their (clearly enviable) gardens before the weather turned. We were given lavender, green bell, hydrangea, statis and most excitingly physalis, which we popped into amber ale bottles to line the windowsills. It was a perfect January wedding - warm, cosy and full of promise for the future. Congratulations Helen and Mike - it was an absolute pleasure. The wild Yucca hails from the warm and dry areas in North and South America and the Caribbean, where they are grown on coffee plantations to create shade for the coffee plants. The Yucca likes a nice sunny patch and a drink (don't we all), but too much water can apparently lead to 'stem rotting' (we have no idea what the human equivalent of this is... ). 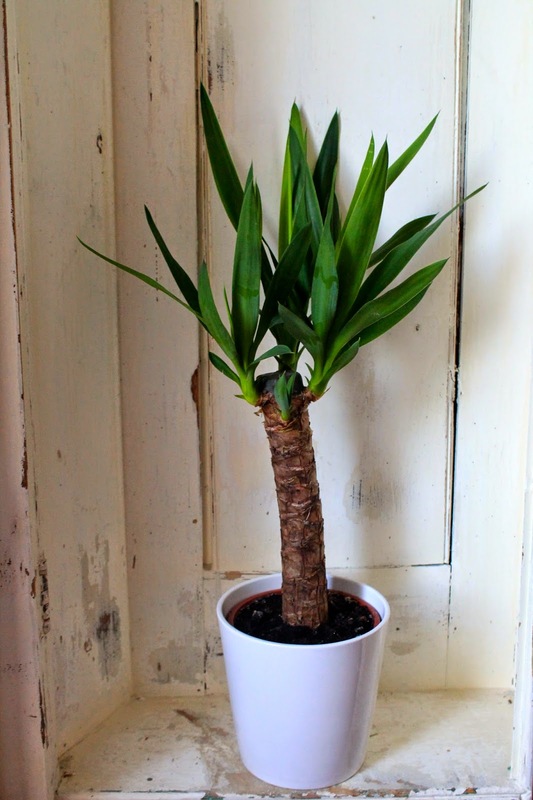 As a rule of thumb with our Yucca, we keep an eye on the soil in the pot and water whenever it’s no longer moist. 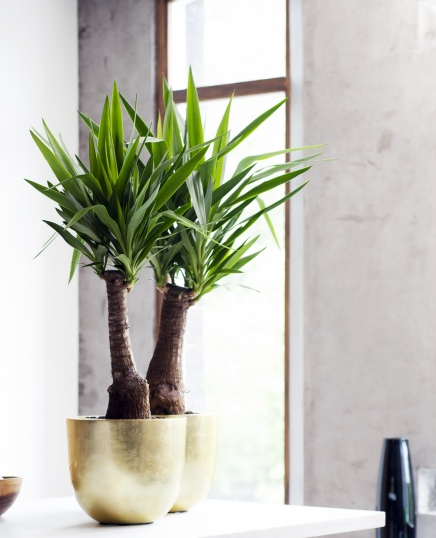 If you are lucky enough to have an outdoor space and live somewhere with decent weather, the Yucca can be outside in a sunny place from May to October. We keep ours indoors because it'll probably get nicked otherwise. Your Yucca may produce white flowers. Great, right? Hmm, maybe not. The Yucca will sometimes flower if it has been neglected. Basically, it’s a bit of an attention seeker. 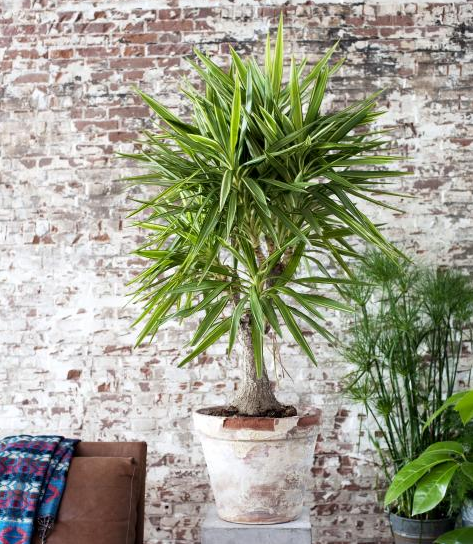 The Yucca is a great houseplant - visually impactful, really easy to take care of and looks super in earthenware pots. It's a new year, and where better to blow out last year's cobwebs and look towards an exciting future than a vibrant town, on a wind-swept beach, along the North Kent Coast. 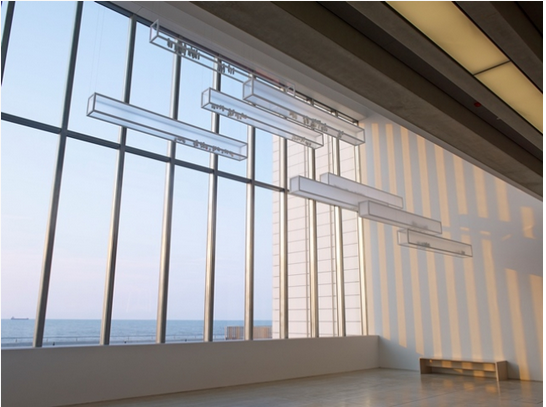 The Sunley Gallery at the Turner Contemporary is currently home to Edmund de Waal's mesmerising 'Atmosphere'; a collection of ceramic vessels suspended in front of a consistently shifting North Sea view. I'm sure I'll never meet a florist who does not have a weak spot for ceramics; the personality of a vase cannot help but dictate the shape and form of a floral arrangement. And no more so than for this florist, whose grandmother was a potter and whose pieces are used, loved and cherished daily. It's an ancient art from, which thankfully endures through those who make it contemporary and relevant. With a nod to the past, we all move forward.